We have just clocked over four years in Dubai. Four pretty interesting years. Lots of ups, a few downs, lots of travel, and plenty of visitors. Eighteen of them actually (though really it’s just sixteen, as two of them were returning guests)! I have to admit that next to organising our own travel (which truly is one of my favourite things in the world to do – does anyone have any idea how I can make a living from it?) I really get off on devising awesome itineraries for friends’ visits to Dubai. I’m like some kind of uber concierge (if I do say so myself), tailoring expeditions and events to each person’s unique predilections. I take into account the visitor’s personality, interests and booze tolerance (very important as you’ll find out later). 4. Something that David and I hadn’t done before. Let me make this clear. A brief like this is HEAVEN to me. It’s focussed, but not too specific. Just perfect. It allows me to flick through my mental filing system of fun things to do without getting bogged down by details. And you know what? We had fun. I admit I don’t ALWAYS get it right. But I’m getting better. And I hope that coming to visit David and me in Dubai isn’t just another thing to tick off your list. I hope it becomes a memorable, stimulating and exciting memory. So, here’s what we did when Greg was here. Greg arrived early. Like 5.20am early. Which wasn’t a huge hassle for us as David and I were both finishing night shifts. By 8am we were all in bed snoozing and resting up for our 12.30pm Champagne brunch at Yalumba. So, brunch at Yalumba is a bit of a Dubai institution. Everyone has to do it once. And for this very reason, David and I have to do it lots of times! It wouldn’t be right for friends to miss out on this experience just because we’ve already done it several times. It’s a sacrifice, but that’s just how we roll. And since we have done it more than a few times (with the battle scars to prove it) we are better equipped to handle the copious amounts of alcohol that flow at the brunch. I say “flow” but that’s like describing a tsunami as “flowing”. Yalumba staff must be the most optimistic people on the planet, because to them no glass should ever (EVER) be half empty. I have, on occasion, had a waitress top up my glass with Taittinger before I’d even had a chance to put it down after taking a sip. They’re like Champagne ninjas! As you might imagine, this makes it virtually impossible to keep track of how much you drink. Consequently, it’s very easy to get completely hammered in a very short period of time. Which is exactly what happened on this occasion. 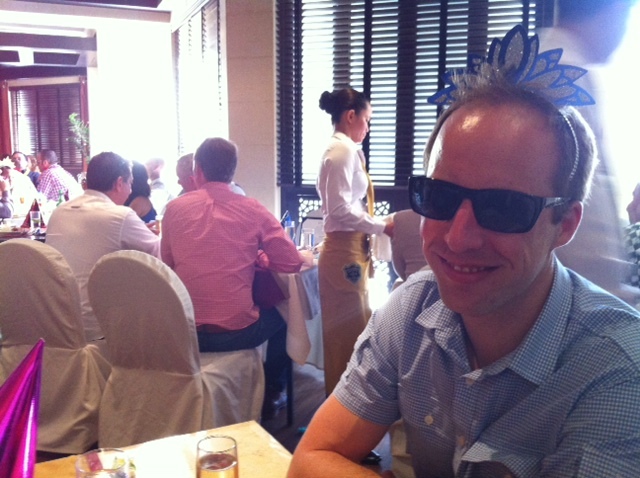 Greg in tiara! Things just went downhill from here. But the fun didn’t stop there. Half price drinks afterwards enticed us (and other punters) to stick around for a few hours afterwards, ensuring lots of after-brunch shenanigans. This included literally pouring with sweat, dirty dancing with complete strangers, sneaking into the roped off swimming pool area (I’m looking at you Greg), followed by being evicted from the roped off swimming pool area, tequila shots (always the first sign of real trouble), and general good times. The good times, unfortunately, stopped for Greg when we got home at about 7pm whereupon he went into his room, closed the door and didn’t venture out again til morning. He claims he wasn’t sick but there would be no shame if he was. He certainly wouldn’t be the first! 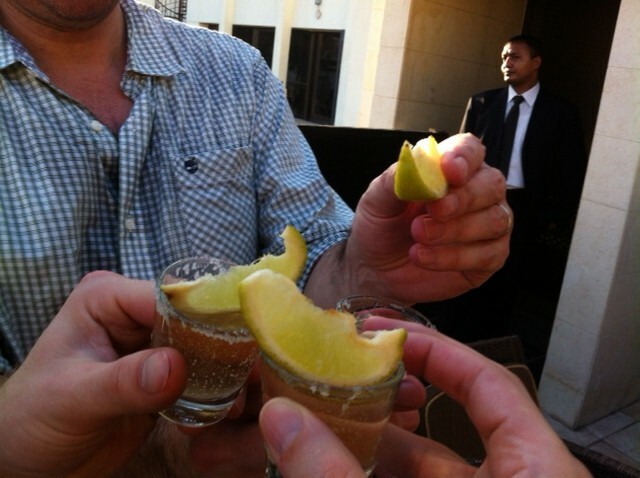 The dreaded tequila shots! Unbelievably, I think we stopped at one. Must have been our years of Yalumba practise that stopped us from having more. Phew! 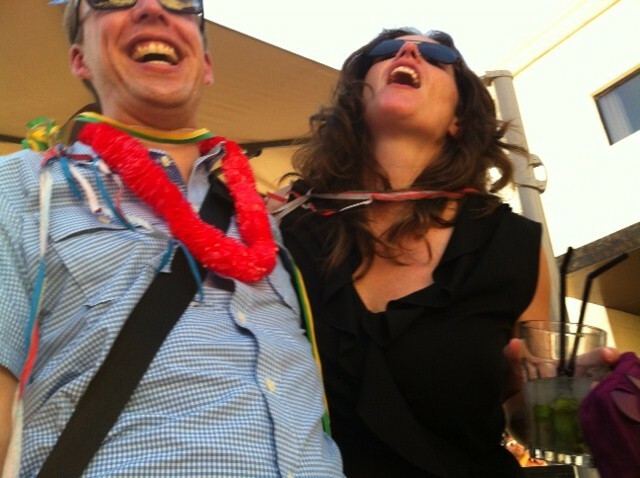 You know you’re having fun when you throw your head back laughing (and have party decorations all over your person). So, Day 2 had been planned as a relatively gentle day to factor in recovery time. We drove to some of the city’s more iconic landmarks for photo opportunities, taking in the Burj Al Arab, Atlantis Hotel and the Palm Jumeirah. And in the afternoon we went up into the most iconic landmark of all, the Burj Khalifa, for high tea (literally the highest tea in the world, situated as it is on the 123rd floor of the world’s tallest building). We declined the champagne option (with a shudder) and opted for the fruity mocktails instead. It was a lovely brunch with fancy open sandwiches (sans bread for me), quiches, mini-cakes and scones with jam and clotted cream. All set to the soothing refrain of a talented harpist. Very civilised indeed. Our tray of goodies. Yum! 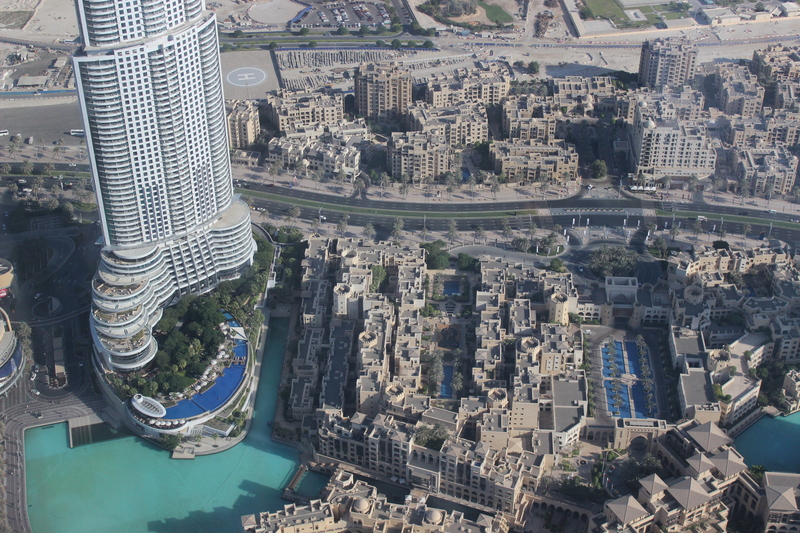 The view of Old Town from the 123rd floor of the Burj Khalifa. 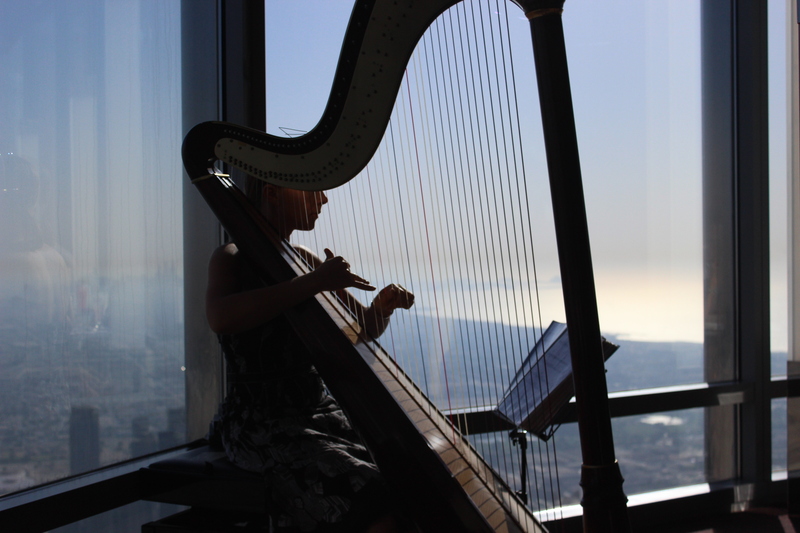 The harpist and her harp. I think Greg took about four hundred photos of her. She managed to ignore him. 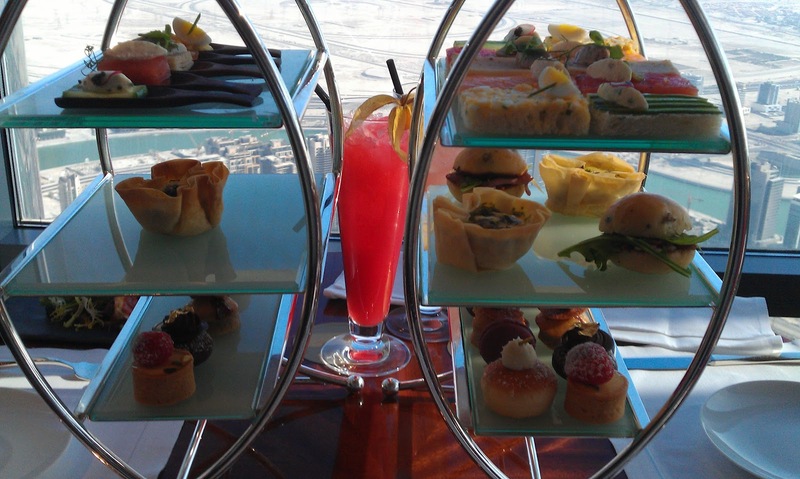 The high tea served as a stark contrast to that evening’s activities. Greg, aware of my interest and (admittedly limited) involvement in helping the less fortunate labourers and workers of the city had requested that we do a food handout. 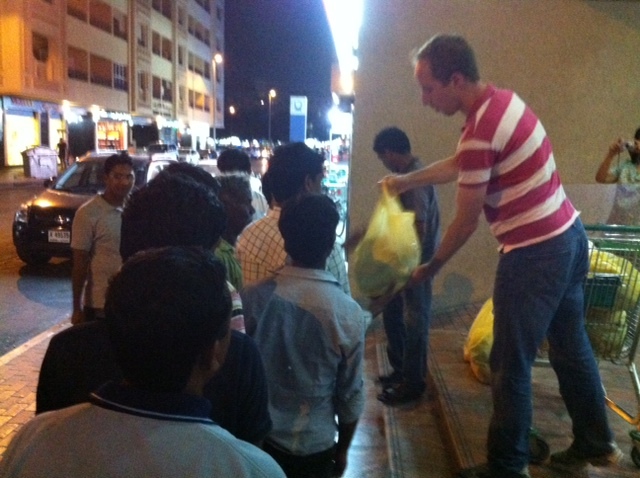 So that night we arranged to meet with 20 men at an Indian restaurant in Karama to buy them a hot meal and give them some food hampers (consisting of rice, oil, lentils, spices, crackers and a few other necessities). The men we were donating to survive by collecting plastic bottles and cardboard and selling them for the meagre price of AED15 per 100kg. Their lives consist of scavenging for a pittance so it felt really great to help them out in this small way. I believe Greg was overwhelmed by how emotional the experience was. Greg handing out the food hampers. 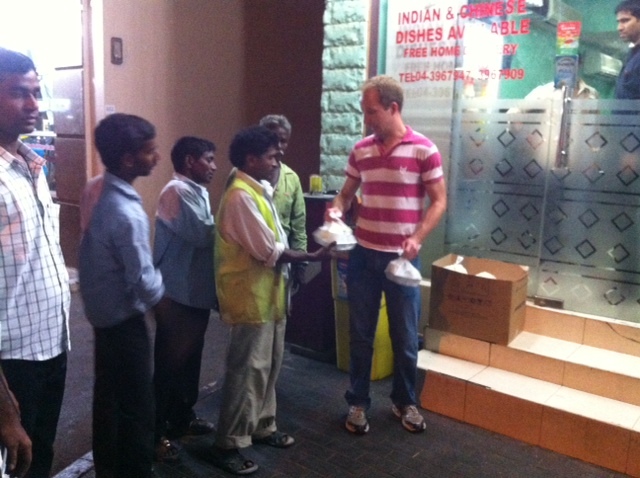 Greg handing out the hot meals from the Indian restaurant. An Emirati man passing by decided he’d line up for a free meal too. Nice try mister!!! After the handout we went to Ravi’s Restaurant for dinner. Ravi’s is a renowned Pakistani restaurant that I’ve been wanting to go to ever since we moved to Dubai. The restaurant itself is nothing special, reminding me of a school cafeteria. But the food blew me away. It was delicious, simple fare and cost a fraction of the price of our high tea earlier that day. Day 3 started with an at-home massage for Greg (the poor love must have exhausted himself at high tea the day before). And it continued into another low key day. Lunch, coffee, a bit of mall trawling, and a magnificent dinner at our favourite Thai restaurant, Mango Tree. The terrace of the restaurant looks out over the Dubai Fountain so we had an incredible view of the water works during dinner. For Greg’s last day, I had arranged a full day trip to Dibba, an interesting town about a two hour drive from Dubai. It’s interesting not least because of its shared ownership, split three ways between the Emirate of Sharjah, the Emirate of Ras Al Khaimah, and Oman! So, even though it’s not in Oman proper, I can technically say that I have now been to Oman! And it truly is stunning. 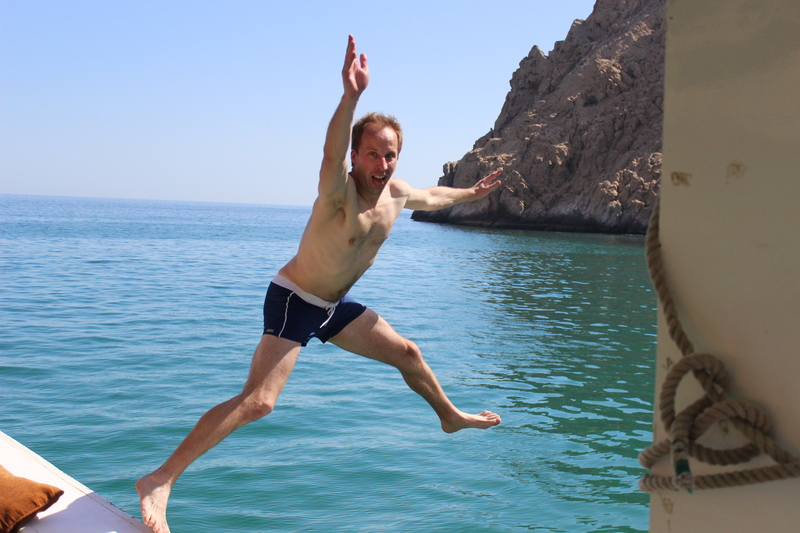 We were booked on a five hour dhow cruise in the Gulf of Oman, stopping several times to swim, snorkel and splash in the gorgeous blue water. David, Greg and I were the only ones onboard that were brave enough to jump off the second level of the dhow into the crystal clear waters. I admit I almost didn’t do it. It was pretty scary perched out there on the railing looking down at the water several metres below. But I had David count me down and just jumped when he ran out of numbers! It was exhilirating. The cruise included a really yummy BBQ lunch of tandoori chicken, roast veggies, salads and a typical Omani dish of rice and meat. After lunch, the staff put on some Arabic music and got everyone dancing. And then (oh, horror of horrors) it was time to dress everyone up in the traditional Arabic dress of abaya (for women) and khandoura (for men). Now, when it started dawning on me that this was going on I started to slowly back away from the group, retreating towards the other end of the boat. There is no longer any novelty factor in me dressing up as an Arabic woman, and I prefer not to do it. I don’t think that donning a religious outfit is the most respectful thing in the world to do. 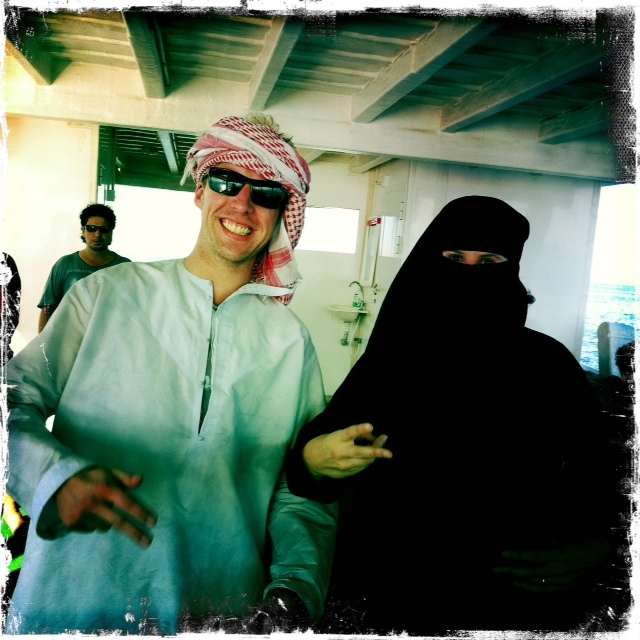 But wouldn’t you know it, when it was Greg’s turn to dress up, the captain of the boat came and found me and coerced me into trying on the abaya. I resisted, I swear. I put up a fight. But he laid a guilt trip on me, saying that Greg would be disappointed if there was no girl next to him for the photos. Sheesh Greg, the things I do for you! Not happy Jan! Still, I look pretty good in an abaya, don’t you reckon? After that we stopped for a spot of fishing. A few people caught some little fishies, throwing them back after taking a photo (the fishing season hadn’t officially started yet). As we started the engines to take off home again, I had an urge to throw my reel back in the water and as we took off I had a bite!! 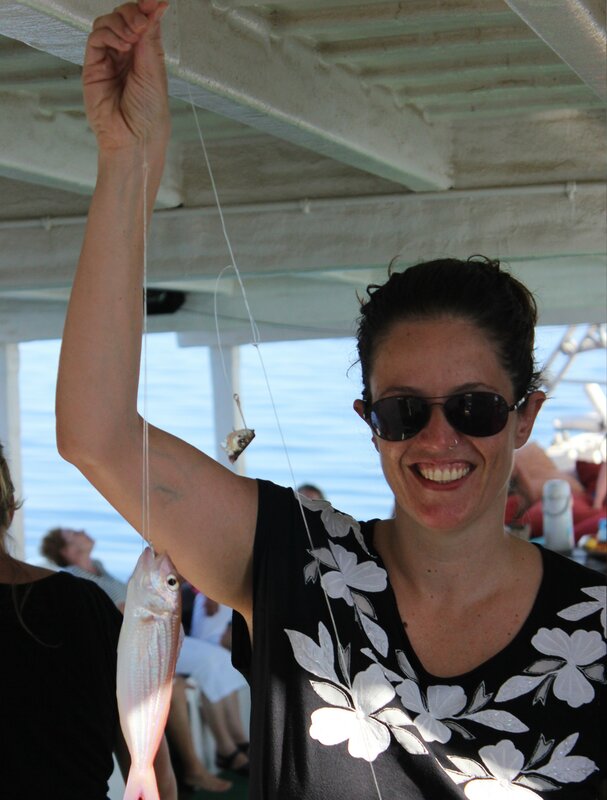 The captain stopped the boat and I reeled in a MONSTER fish! It could have fed a small Omani village for days, don’t you think?? After the arduous two hour drive home we didn’t really feel like doing too much. David and I had to get up early to go to work the next day and Greg was flying out in the afternoon, so we chilled out at home and made our famous nachos for dinner (which Greg declared the best nachos he’s ever had, thank you very much). We also messed around with cocktails, concocting one in Greg’s honour. It’s called “Greg Is Greener” and yes, it is green! The secret ingredient is melon milk! Also: tequila!! It’s tastier than it sounds, I swear! And, thus ended Greg’s four day trip to Dubai. I hope he had as much fun as we did. We are always happy to have people come and visit us, so next time you’re planning a trip to Europe or the region just let us know and we’ll whip you up a personal itinerary for maximum fun. And you can be sure, it’ll be fully customised, just for you!